To be human is to yearn for adventure. We seek out paths untraveled and sights unseen. We blaze trails and take destiny into our hands. Taking a vehicle off road connects a driver to this feeling of adventure. One goes where not all can go. One sees what not all will see. Quadra-Drive II 4WD System: This system keeps 4WD on always and features an electric limited slip system that allows up to 100 percent of available torque to reach one rear wheel. Enhanced Styling: The Trailhawk features more aggressive styling than other trim levels, with tow hooks, anti-glare hood decal, and 18-inch aluminum wheels. Quadra-Lift Air Suspension: This suspension system allows for ground clearance to lift to 10.8 inches. Interior Comfort: Bolstered performance seats keep you in place while off road. Powerhouse Engines: an available 5.7 liter HEMI V8 with 360 horsepower and 390 pound-feet of torque will pull you through most any obstacle. 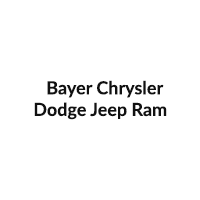 Begin your Grand Cherokee adventure at Bayer Chrysler Dodge Ram.